Demure Hestia, help me to focus. The hearth of the home is your eternal locus. Hestia ("the heart") was the goddess of hearth, home and family. Home is where the heart/hearth is. Each city had a public hearth sacred to Hestia, where the fire was never allowed to go out. At festivals she was the first goddess invoked, and she was also offered blessings at the beginning of each meal. Hestia was also one of the three virgin goddesses, and turned away both Poseidon and Apollo. She petitioned Zeus to remain a virgin and he respected this right. Hestia was originally one of the twelve supreme gods on Mount Olympus, but she grew tired of the petty intrigues and wrangling that went on amongst the Olympians. So she gave up her position, her throne to Dionysus, the god of wine. As a result, it was said that she still received part of every offering made to the gods. This trump in the Tarot is THE CHARIOT which represents the vehicle of conveyance for consciousness. The Chariot allows us to take consciousness journeys through the wide realm of the imagination. It harnesses the opposites to create volition. This requires a turning inward from the vast array of stimulation bombarding our senses from the outside, and finding a still center. Riding on this Chariot, the Throne Chariot of God, the wheels turn, but the axle moveth not. This is the prudent, balanced life, open to the inner self and quietude, pursuing the conquest of illusion. Receptivity is increased by silence, retirement from participation. The path of the Chariot transcends all sense of "my-ness"and is seldom personal in its implications. It describes someone who has conscious awareness of purpose; already refined in body, mind, heart and soul to be a clear vehicle for the presence of Indwelling Spirit (Compton, 1991). In the physical world, it is the field of all undifferentiated substance; alteration, vibration, flux and reflux, involution and evolution, and also culture, education and growth. Water, in both metaphysical and Jungian terminology, represents the "sea of the unconscious," in metaphysics, the ocean of pure, clear Light. It is the restoration of the Word, the "Voice of the Silence," which contains secrets uncommunicable with human tongue. In Kabbala, Shekinah is revealed through the alchemy of letters themselves. Occult speech, or meditation by passes the mind and influences us through the subconscious. Spirit then flows in abundance. Form becomes a vehicle for Spirit's intention, and form is directed toward its ultimate reunion with its Source. 'Cheth' is the enclosure or container of spiritual essence. The Chariot is the carrier of our own special journey toward individuation. The human personality is likened to a chariot, the vehicle of our lives. It is 'rest within movement,' loss of sense of self-identity, pure non-attachment without cravings. The goddess of this deep center or introversion is Hestia. She helps us find that quiet state of consciousness which characterizes contemplation and meditation. She helps us focus our attention inward in a non-heroic, non-linear manner. Hestia is essentially a goddess of meditation and a balanced lifestyle. She is the Will to be receptive to the influx of higher power, to digest both inner and outer experience which increases foresight or circumspection. She finds ways to express the exalted aspects of love. What we call 'volition' is the synthesis of all the universal forces coming to a focus at a point within us. It is the Will, the power of choosing; a conscious choice or decision, sometimes measured by our ability to "let go." It means the choice between our idealized, glamorized fantasies and plain, simple reality. It means abandoning even 'positive' thinking which is a polarity, for an unvarnished truth -- discretion, discernment. This trump is about the conquest of illusion through connecting with the inner self -- inner conviction -- a vision quest. THE CHARIOT symbolizes control over the tension of opposites, and that is also the nature of meditation, a suspension of the duality and polarization that characterize outer life. The corresponding Hebrew letter is Cheth, which means 'fence.' Meditation is the fence around the crop of our contemplative efforts. Like THE CHARIOT, the personality is a vehicle for cosmic forces which operate within us largely at the subconscious level. This trump represents the power of astral projection and attraction. When we meditate, we may be physically in our rooms, but mentally far, far away; or, perhaps our imagination brings strong images of another to us. Meditation is simply becoming aware of these patterns, then moving past them to the depth where the still center appears as the Void or the "I AM." The Chariot is about setting forth on the journey of spiritual development. In Hebrew, the word for Chariot is merkabah, and it is associated with a form of mysticism. In throne mysticism, the aspirant is absorbed in visual contemplation of the Throne-Chariot of God. Hestia was originally one of the twelve Olympians. She was the first-born child of Cronos and Rhea, and the first to be swallowed up again when Cronos realized he would be overthrown by one of his offspring. Hestia is such a gracious and pliant goddess that when Zeus wanted to make room on Olympus for the arrival of Dionysus, she gave up her place among the divine dozen. Apparently she did not mind being displaced since she carries "the center" within herself. She has a sense of direction, of purpose inside. Her personality is typically humble, letting life find unobstructed manifestation through her. Her mytheme is renunciation. Her mandate is seva, or service. She is self-controlled, self-disciplined. She is the quiet type, but her unuttered speech contains the power of silence and secrecy which comes from the control of language. It increases receptivity. She is a self-sufficient individual who derives her sense of self worth from within, as shown by her perpetual maidenhood. This Virgin Goddess is a variation on the archetypal theme of the Holy Grail. Hestia is the virgin goddess of the hearth and its fire, as well as protectress of the home and of the state. She "keeps the home fires burning," as goddess of hearth and home. Her attributes include Intuitiveness; Female energy; Receiving information from within. 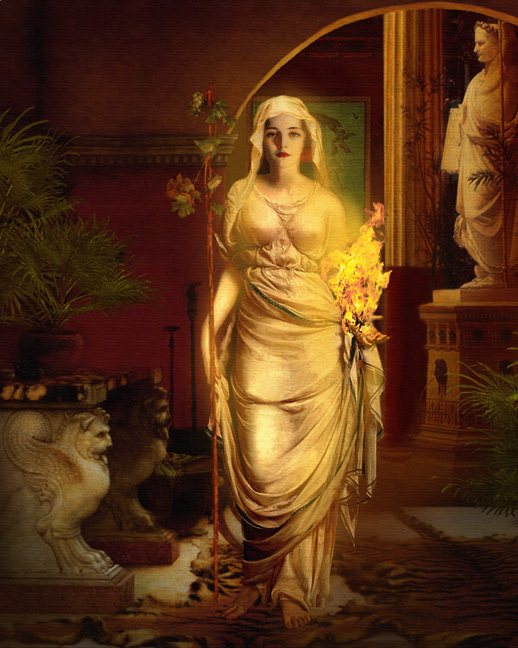 Hestia as the goddess of home and hearth, represented the ideal of purity in these areas. Possibly for this reason she was an eternal virgin, deliberately remaining aloof from the advances of the male gods. It is important to note, however, that both Poseidon and Apollo sought to court her, but she refused them. Indeed, it is also worth mentioning that in Greek mythology, Hestia, along with Athena and Artemis, were the only goddesses who were immune to the passions aroused by Aphrodite. Despite her importance in Greek religion, Hestia is not well represented in either mythology or art. Be that as it may, the goddess received her share of honors, including a Homeric Hymn. "Hestia, you who tend the sacred dwelling of the far-shooting lord, Apollo, at holy Pytho, from your tresses flowing oil ever drips down. Come to this house! Come in gentle spirit with resourceful Zeus and grant grace to my song!" Her sacred fire was moved from Greece to Rome by Aeneas who was from Troy. The tendency of fire is to transmute a material substance into a more rarefied form. This is also true of spiritual fire; it means the dominion of the spirit over form. When we can observe what is unworthy in ourselves, this fire purges us of corruption. In her temple in the Roman Forum, six vestal virgins watched by day and by night to assure that the sacred fire did not die out. These virgins, consecrated to Vesta (Hestia), maintained the sacred fire or perpetual flame which was kept burning on her altar. Psychologically, this initiation meant that the temptations of the physical world were surmounted. The six vestal virgins entered the service of the goddess around the ages of six to ten years old. Their term of active service lasted thirty years. After that they were permitted to marry, though few did since they were instilled with the virtues of this goddess. They received great honor and had very important public privileges. Their persons were considered inviolable, and woe to the vestal found guilty of unchastity. If her spotless chastity were not maintained, she would be immediately killed along with her lover. HESTIA: goddess of the sacred hearth, both of the home and of the nation. She drew more attention in Roman culture than in Greek (called her Vesta). Personified the glowing fire on the family hearth, the natural center of the family and of gatherings of family or clan. The domestic hearth was also the sacrificial altar and Hestia was mentioned first and last in every sacrificial ceremony. Signifies sacredness of being centered, rooted, and contained in a collective group and in a particular region, a local soil. Vestal Virgins in Rome fed an eternal flame honoring sacred loyalty to family, tribe, city, and nation. Associated with home, nativeness, hearth, patriotism, nostalgia for place. Embodies the “geographical soul,” an aspect of the psyche that has been determined by the geography/culture out of which one is born. The place that the soul identifies with most. One cannot worship at the hearth of the human family until one has first worshipped at the hearth of one’s particular locality. For the larger and more comprehensive viewpoint to be authentic, it must be based on a solid relation to one’s particular origins; otherwise, the group can be nothing more than the source of alienation. Still two words on hestia, namely how to live the earth without decine. Hestia was the daughter of gea and Uranus, as well as sister of Zeus, Hades, of Demeter, and was of Poseidon. Let's say a beautiful and large sibling from a good family. In a beautiful work of a few years ago luce irigaray reflecting on the figure of Hestia (Vesta) and recovering an interesting study of the philosopher Jean-Joseph Goux ("the interrelations de hestia") is to analyze the path nostalgic, as he calls it, Of Heidegger pointing in search of the possibility of "living the earth from mortals", Without giving up to the size of the divine. In the philosophy of heidegger is well known that the term " being " is often likened to that of " live ". To Corroborate this coincidence of words, goux reaches the indo-European roots of two words to which it relates the name of the goddess hestia, goddess of the hearth and home. The Divine would seem to be preserved and guarded by the woman in the house and it would send from mother to daughter. For the Greeks when a girl was in the bride, the mother lit a torch at the altar of his hearth and wore it, ahead of the young married couple, up in the new house, where he'd light the first fire of the altar servant of his daughter. This fire (Light) expressed the custody and the protection of purity by the woman, purity that it didn't mean at all, the expression of a virginity (Virginitas) defensive and sessuofobica and not even a kind of loyalty to the patriarchal culture, but the sense of a Loyalty of woman to his most intimate women's identity and his same genealogy feminine. The respect of all these qualities and subsidiaries of females would be the guarantee of the sacred character of the house. The loss of the size of the dwelling on earth would manifest itself with a real oblivion and wanted a forgotten of hestia for the benefit of male deities that the philosophy itself would have defined "light blue". These same of extraterrestrials (Uranici) would make us all foreigners to life on our earth, which from then on would be considered a real exile. So recover the psychological and symbolic meanings of hestia has profound consequences and resonances not only on our psychic life but also the meanings of sanctity that we attach to the earth and to our own home. Hestia is the goddess of the hearth. She is also known as Vesta (Roman). Although an important deity in Greek religion, she is rarely depicted in art, and has virtually no mythology and iconography. Hestia, being the first to be swallowed, was the last to be disgorged, and so was at once the first and latest born of the children of Cronos. In the high dwellings of all, both deathless gods and men who walk on earth, you have gained an everlasting abode and highest honor: glorious is your portion and your right. For without you mortals hold no banquet, --where one does not duly pour sweet wine in offering to Hestia both first and last. The self-sufficient goddesses, Artemis, Athena, and Hestia were known in antiquity as the virgin goddesses. None of them ever married or had children. For a modern woman, these archetypes do not denote a physical status or age, but a state of mind. Emotionally, she is self-contained, needing only her own approval. While the self-sufficient woman may eagerly welcome company and truly enjoy being a wife and a mother, she also finds contentment in solitude. These three archetypes are often described as independent and strong. Some women's jobs require years of formal education or take them to an office everyday. Other women work from the heart or from the home. Hestia is the goddess of sacred wisdom and the hearth. Known as Vesta to the Romans, she was the patroness of the Vestal Virgins, who guarded the sacred flame of Rome and the prophetic writings of the Sibyl. In myth, Hestia is the wise woman of the village, the priestess or seeress in the temple, the witch of the forest. She is the crone aspect of the triple Goddess, no longer beholden to parent, husband, or child, but belonging only to herself and to the tribe. An ancient woman of mystery and hidden knowledge, she guards crystals which have a power older and greater than Immortals. No matter if the walls of her castle are upright or crumbled, her inner serenity is her strength, and to those who are troubled, she offers a refuge. She also guards ancient secrets and possesses magical powers; older characters embody the dignity of the wise and aged woman, something we have tragically lost sight of in the modern world. The three virgin goddesses are archetypes of women and their work: the Warrior Caste, the Worker Caste, and the Religious Caste. But no man is an island, and in this, women are the same as men. Women have jobs, and women also have families, and a large part of women's lives is influenced by the people they know. Hestia is more straightforward. She is also a virgin, but unlike Athena and Artemis, she never had any consorts or sexual relationships. She is thought of as a living flame, associated with stability, permanence, prosperity and the hearth. She is depicted as an austere, fully robed mature woman. There are few stories about her myth but she obviously displays all the virtues of the Greek wife. There is duality, developed during patriarchal times, between the feminine home-world or Hestia and the masculine public-world or Agora. Increasingly the Agora has been considered the only "important" world, but in fact until recently most of human life, including education, entertainment and work centered on the Hestia. We are the physical focal point of all the generations who have gone before us--and all those who will follow us, as our progeny. This focusing of life force through the family is a physical representation of the Holy Grail -- the container of the manifestation of the divine. Another aspect of Hestia in the physical world is shown in the patterns in the structure of matter. Hestia is characterized as being immobile or in repose. Her balanced personality and equanimity reflect the characteristic of equilibrium. Dynamic equilibrium may also be expressed in living systems as homeostasis. In physics, the structure of matter can be expressed mathematically. The condition of most-economical maximal stability is expressed in the geometrical form known as Vector Equilibrium. It underlies the structure of the atomic nucleus of all atoms, therefore all matter. It is the blueprint for the stabilization of matter from nothingness. Vector Equilibrium is produced by connecting the centers of twelve circles clustered around one, also known as closest-packed spheres. This condition of maximal equilibration forms the basis for the way energy travels within the nuclei of atoms, and is therefore a very fundamental principle in the construction of the universe. Curiously, this particular geometry is described in an ancient Hebrew text known as the SEPHIR YETZIRAH, or THE BOOK OF FORMATION. To the ancient Hebrew mystics, it was known as the Throne Chariot of Fire. It linked the manifest with the archetypal world. Its geometrical form was used in a meditation practice. It was a vehicle for moving consciousness from one plane to the next. Vector Equilibrium represents the balancing of opposite factors. The Tarot Trump VII, THE CHARIOT depicts this vision of a divine Chariot. The concept of balancing opposites is carried further by the fact that this card with its fiery symbolism is attributed to the astrological sign Cancer, a water sign. This places or locates it in the domestic realm of hearth and home. It also links Hestia with the virginal qualities of the moon(Cancer is ruled by the moon). This path on the Tree of Life leads from Binah to Geburah, showing the influence of the Supernals descending through "the veil of Water (which is blood) upon the energy of man" and so inspiring it. On the Path of Return, this is one of the few paths which spans the great Void, known as The Abyss. Since Hestia was the first-born of Cronos and Rhea--time and corporeal matter--she might be seen as that heat produced as a by-product of the creation. She is an expression of entropy. In the spectrum linking microcosm to macrocosm, she is the central fire in the warm-blooded human body, the home (the hearth), and the molten magma at the center of planet Earth. Even the fire in the center of the Sun is analogous to these, inasmuch as it occupies a specific locus in space and time, and therefore shares its origin (if not its form) with them. These central fires warm and nourish and promote growth. It is intimately linked to the survival of the human species. Without our warm blood, we would never have developed our higher faculties. It was a classical practice for the first and last tribute at any ritual to be offered to Hestia. She is truly the beginning and end for human consciousness. Without her receptive, containing 'space' there is no resting place for the atoms of the human body in the universe. I. Miller recounts the brain centers which are responsive during prayer and meditation in "Neurotheology 101" (2001). "Brain scans of a large sampling of people lost in prayer or deep meditation reveal certain common neurological underpinnings which correlate with religious states from transcendence, to visions, to enlightenment and feelings of awe. Attention in the frontal lobe is indicated by activation in this area of the brain during meditation. When the parietal lobes quiet down, a person feels an expansive oneness with the universe or cosmic unity. For a mystical experience to occur, brain regions that orient us in space and mark the distinction between self and world must go quiet. In order to feel that time, fear and self-consciousness have dissolved, certain brain circuits must be interrupted. Which ones? Activity in the amygdala, which monitors the environment for threats and registers fear, must be damped. Parietal-lobe circuits, which orient you in space and mark the sharp distinction between self and world, must go quiet. The orientation area requires sensory input to do its calculations. Intense meditation blocks the brain from forming a distinction between self and world. Frontal- and temporal-lobe circuits, which mark time and generate self-awareness, must disengage. When this happen what we think of as our 'higher' functions of self hood appear briefly to drop out, dissolve, or be deleted from consciousness. Our response to religious words is mediated at the juncture of three lobes (parietal, frontal and temporal) and governs reaction to language. The "voice of God" probably emanates from electrical activity in the temporal lobes, important to speech perception. Inner speech is interpreted as originating outside the self. Broca's area, responsible for speech production switches on. Stress can influence one's ability to determine origin of a voice. The right anterior cingulate turns on whether a stimulus originates in the environment or is an auditory hallucination. Hyperarousal by sensory stimuli, such as drumming, dancing or incantations, can amplify emotions and send the system into hyperdrive. The equilibrium of the hippocampus is overwritten, inhibiting the flow of signals between neurons. Certain regions are then deprived of neuronal inputs. When the orientation center is isolated with ritual and liturgy or meditation, the boundaries of the self begin to dissolve. Sacred images are generated by the lower temporal which also responds to ritual imagery and is facilitated by prayer and meditation. Religious emotions originate from the middle temporal lobe and are linked to emotional aspects of religious experience, such as joy and awe. Yet neural correlates don't mean that these experiences exist "only" in the brain or are merely illusory; they are associated with distinct neural activity. There is no way to distinguish if the brain causes these experiences, or is actually perceiving spiritual reality. There are a wide variety of theories and mechanisms presented as influential spiritual transducers. Many of these biological systems work together in a variety of ways to create different experiences from deep meditation, to ecstatic trance, Near Death Experiences (NDEs) to Cosmic Consciousness. Cosmic Unity and a sense of Eternity (sacred or cosmic time) occurs when the parietal lobe quiets down; self-identity vanishes or expands to universal proportions. When the orientation area is deprived of neuronal input by gating from the hippocampus, sense of self expands. The role of suspension of sense of orientation in 3 or 4 dimensions of spacetime is interesting in terms of the prevalance of systems of sacred geometry in mysticism to facilitate gestalt experiences. There are many ritualistic and meditational devices from Mandalas or Yantras, to Middle Pillar Exercise and the Diamond Body, to Merkabah mysticism which promote inner plane orientation. In parapsychology, such devises are known as Psychotronics and function as "time machines." This could imply that focusing or intense concentration on these internally-generated signals for orienting in sacred spacetime creates a paradoxical rebound which we feel as dissolving into cosmic consciousness, where beginning and end are cotemporaneous. This may be why meditators are urged to remain motionless to achieved the desired state. Mystics say that if you move during meditation, the attention will be drawn back down into the body and worldly attachment. When there is no movement there is no external reference signal to orient in 3-space and no reason for this portion of the brain to activate. Intensive meditation can over-drive certain other brain areas and seemingly transport us to another universe. And just as, in terms of symmetry principles, a complete description of the Universe contains no information that serves to define a preferred position or direction in space, the local self dissolves in an omnidirectional expansion. Sacred images are generated in the lower temporal lobe which also responds to ritualistic use of imagery and iconography. Religious emotions originate in the middle temporal lobe, generating bliss, awe, joy and other feelings of well-being or sense of Presence. Fear or awesomeness originates in the amygdala. The frontal lobes help us form concentrative trances through focusing, often employing any constant rhythmic stimulus to the CNS, such as drumming or mantras to facilitate concentration and drive the process." (I. Miller, 2001). One of the three virgin goddess on Mt. Olympus, Hestia vowed to her brother Zeus that she would remain a virgin forever in a symbolic gesture of spiritual purity and integrity. Modern Hestia women can find romantic happiness with Apollo and Hermes. Because they do not crave attention, are most content at home and enjoy a simple life, Apollo men are their best match. They are attracted to women who are steady and balanced, and also like to be in control of the relationship. That's okay with Hestia, as long as she has a beautiful, peaceful home to maintain and inhabit. Apollo men will gladly provide her with this, as they are not only successful but also take after the god of architecture, symmetry and balance. Apollonian men and Hestian women are both at home with themselves, which offers great strength and stability in their pairing. Meet a Hermes man and you will find that he can bring great joy to your life. Hermes men are childlike and lighthearted, two qualities that will help Hestia escape her more serious side. She is very much like Vesta, a virgin fire goddess of Rome. Her fire is concealed within her body; much like the fertility of Earth is concealed within the frozen ground of winter. Vesta is based on the Greek goddess Hestia, who does a fine job of representing this moon. Myth tells us Vesta was given a choice of marriage between Apollo and Neptune but refused both. Zeus then granted her freedom. Vesta's temples are round with a central sacred fire; this fire was tended and maintained by young female initiates called vestals. These girls kept the eternal fame of the temples burning. The vestal virgins went through three phases of service; first, that of student, then as priestess, and finally as teacher. Vestals were by no means celibate, though their career as a vestal often ended when they had their first child. Hestia helps us lead a balanced life by providing a sense of center. The holy precinct makes communication with the divine forces possible. Thus we can harmonize inner and outer reality through her power. She was rarely personified in human form. Rather, her image is architectural; she is the hearth itself with the structure surrounding it and protecting it, also. Hestia provides places, nexus points and spatiality. She gives us gathering places, power places, and dwelling places. We might think of her calming energy when we "can't settle down." She is important psychologically because without her we couldn't focus on an image. She is not personified, therefore, but is the "place" where personifying occurs. Stability of the inner self, or a sense of belonging are Hestian. As the goddess of locality, Hestia reminds us of the sacred nature of being rooted in a particular area and nation. The yearning to seek out our "roots," and the resurgence in nationalism and patriotism all show the relationship between psyche and geography. Every area has its natives or regional souls who are adapted for survival in the climatic conditions and prevailing cultural values. It is not possible to come to a universal citizenship without giving due respect to our genetic inheritance. Hestia provides the focal point at the center of the world; and on a personal level we all tend to feel that we are the centers of our own special perspective on reality. We are each the center of our own Universe--and our consciousness projects that vision of the universe outward. When that projection "comes home to rest" we experience that reabsorption as the pure void, ground state of our being. She is the sanctuary at the center, the holy ground, the magick circle. On an even deeper level, Hestia represents an archetypal image of the Self. This is represented in Crowley's Thoth Tarot on Trump VII as the circular image of the Holy Grail. This mandala symbol, or sacred circle, depicts a state of harmony, wholeness, and integration, much like the native American medicine wheel. It contains "blood," that which is simultaneously fire and water, a paradoxical union of opposites. Hestia thus shows herself as a central aspect of psychic life--that of concentrating or focusing of one's energies. The concentrating of individual energies is shown by her virginal nature, which she shares with Athena and Artemis. It is a positive form of being self-centered. She is the light which makes the mysteries of life clear through understanding. "a man's home is his castle"
Holism is the philosophy or worldview permeated by Hestia consciousness. Holism is a healthy respect for the connectedness of things, the deep ecology of life and matter -- the realization that the whole is greater than the sum of its parts -- the seamless mind body connection, the identity of psyche and substance. It is the counterpoint to atomistic reductionism, to postmodern de-construction. In Science holism is the belief that complex systems may be understood only when viewed in their entirety. The view that parts of a system have significance mostly in virtue of their interrelations with other parts. The concept of holism is at the center of far-reaching changes in various areas of philosophy in the second half of the 20th century. Holism in epistemology and the philosophy of mind is widespread among analytic philosophers subsequent to the work of the later Wittgenstein and to Quine's "Two Dogmas of Empiricism". Roughly speaking, the claim is that (a) for a person to have beliefs, a social, linguistic community is required and that (b) single beliefs have a meaning only within a whole system of beliefs. Furthermore, holism is discussed as an option in science, in particular in the interpretation of quantum physics. Opting for holism in any of these areas has considerable consequences for our philosophical view of the world and ourselves. Holism in quantum physics is said to refute atomism, which has been predominant in modern philosophy of nature. Holism in epistemology and the philosophy of mind is seen as an alternative to what is known as the Cartesian tradition, which dominated modern thought down to logical empiricism. A good deal of research work has been done on holism in each of the mentioned areas. But there is as yet no research work that provides a critical overview of holism in general. That is to say: we lack research work that focuses on a general conception of holism, enquires into possible connections between different forms of holism, and evaluates the significance of such connections for contemporary philosophy. Holism as an idea or philosophical concept is diametrically opposed to atomism. Where the atomist believes that any whole can be broken down or analyzed into its separate parts and the relationships between them, the holist maintains that the whole is primary and often greater than the sum of its parts. The atomist divides things up in order to know them better; the holist looks at things or systems in aggregate and argues that we can know more about them viewed as such, and better understand their nature and their purpose. The early Greek atomism of Leucippus and Democritus (fifth century B.C.) was a forerunner of classical physics. According to their view, everything in the universe consists of indivisible, indestructible atoms of various kinds. Change is a rearrangement of these atoms. This kind of thinking was a reaction to the still earlier holism of Parmenides, who argued that at some primary level the world is a changeless unity. According to him, "All is One. Nor is it divisible, wherefore it is wholly continuous.... It is complete on every side like the mass of a rounded sphere." In the seventeenth century, at the same time that classical physics gave renewed emphasis to atomism and reductionism, Spinoza developed a holistic philosophy reminiscent of Parmenides. According to Spinoza, all the differences and apparent divisions we see in the world are really only aspects of an underlying single substance, which he called God or nature. Based on pantheistic religious experience, this emphasis on an underlying unity is reflected in the mystical thinking of most major spiritual traditions. It also reflects developments in modern quantum field theory, which describes all existence as an excitation of the underlying quantum vacuum, as though all existing things were like ripples on a universal pond. Hegel, too, had mystical visions of the unity of all things, on which he based his own holistic philosophy of nature and the state. Nature consists of one timeless, unified, rational and spiritual reality. Hegel's state is a quasi-mystical collective, an "invisible and higher reality," from which participating individuals derive their authentic identity, and to which they owe their loyalty and obedience. All modern collectivist political thinkers - including, of course, Karl Marx - stress some higher collective reality, the unity, the whole, the group, though nearly always at the cost of minimizing the importance of difference, the part, the individual. Against individualism, all emphasize the social whole or social forces that somehow possess a character and have a will of their own, over and above the characters and wills of individual members. The twentieth century has seen a tentative movement toward holism in such diverse areas as politics, social thinking, psychology, management theory, and medicine. These have included the practical application of Marx's thinking in Communist and Socialist states, experiments in collective living, the rise of Gestalt psychology, systems theory, and concern with the whole person in alternative medicine. All these have been reactions against excessive individualism with its attendant alienation and fragmentation, and exhibit a commonsense appreciation of human beings' interdependency with one another and with the environment. In an online debate, sponsored by Journal of Consciousness Studies, in "Faster than Thought: Holism, Homogeneity and Temporal Coding," Thomas Metzinger, offers his chapter taken from the collection Conscious Experience. The space of consciousness is the space of subjective experience. Since this is the space in which the world and we ourselves appear to ourselves on an experiential level, I will also call it the phenomenal space. Many people believe that our phenomenal space is also a representational space: In this space we represent a part of the world and of ourselves to ourselves. The phenomenal representata, i.e. the vehicles of representation bearing subjective content, I will henceforth call 'mental models', without trying to explicate this concept further at this point. Our conscious space - this is the basic idea - consists of mental models which are often embedded in each other. The largest of the mental models active in this space is our conscious 'model of reality' or 'model of the world'. This phenomenal model of the world contains all the other conscious mental models and its content is identical with the overall content of our conscious space. But since we are beings who almost constantly fail to recognize our mental models as models, our phenomenal space is characterized by an all-embracing naive realism, which we are incapable of transcending in standard situations. In this way, the totality of mental contents which fill this space form a structure that can be described from the external perspective of science as a self-referentially opaque phenomenal model of the world. From the internal perspective of the system activating this model, however, this structure is quite simply subjectively experienced reality: the only reality existing for this system. One of the main challenges for any naturalistic theory of mind is that of providing us with a clear account of this transition: How does a model become this reality? Although I am not able to dissolve the highest-order wholeness of reality or of myself simply by a reversible act of will, I am perfectly able to perceive or even actively generate lower-order phenomenal wholes within the space which is held together by this highest-order property. Perhaps this holistic character of reality, which is stronger than mere numerical identity and which cannot be transcended experientially, could be described as phenomenal coherence: Our conscious experience of reality is held together internally by a principle or a mechanism, which itself is subjectively inaccessible. This coherence of my reality has nothing to do with the concept of coherence in physics or logic. Rather, it is responsible for a succinct phenomenal holism, which we ought to take into account on the conceptual level. Although a world made out of discrete, building block-like elements could well be a unity, it could never be a whole. But my world is not a toy world composed of little building blocks: it is also a living reality whose parts interact in a quasi-organic way (in the sense of the German concept Erleben). This concretely experienced unity of a diversity is accompanied by a multitude of dynamic part/whole relations. Thus, the additional phenomenological aspect of holism or wholeness which goes beyond mere unity results from the fact that the parts constituting the phenomenal model of reality are not elements, but parts of this reality. For this reason, if we want to understand the holistic character of our phenomenal world, we will have to take its multi-levelled structure as the starting point of our investigation. Another aspect is important in order to understand what else can be meant by 'wholeness'. Although this aspect is not at the center of discussion, we will repeatedly encounter it whenever we ask ourselves how a model can turn into a reality which is phenomenally present. This second aspect consists in the fact that the experiential contents appearing in our conscious space are joined together into a holistic entity of the highest order, something we might call a global Gestalt, by spatial neighbouring relations and especially by temporal identity within an experienced present, i.e. by subjective simultaneity, by being given within a single psychological moment. This global Gestalt quality is necessary for the whole to become a reality. The whole is always given to us in a single psychological moment, that is to say in the experienced present of a subjective Now. The phenomenal presence of the whole springs from this 'now', i.e. from the temporal identity of a diversity of experiential contents. What does this mean? It means that the holistic diversity of phenomenal contents becomes a coherent reality because there is an elementary 'window of presence'. One thing cannot be doubted from the first-person perspective: I always experience the wholeness of reality now. This yields a first phenomenological concept of conscious experience: Conscious experience is the phenomenal presence of an all-embracing whole. There is also mental holism, and semantic holism. (Following discussion forthcoming in The Routledge Encyclopedia of Philosophy): Mental (or semantic) holism is the doctrine that the identity of a belief content (or the meaning of a sentence that expresses it) is determined by its place in the web of beliefs or sentences comprising a whole theory or group of theories. It can be contrasted with two other views: atomism and molecularism. Molecularism characterizes meaning and content in terms of relatively small parts of the web in a way that allows many different theories to share those parts. For example, the meaning of 'chase' might be said by a molecularist to be try to catch. Atomism characterizes meaning and content in terms of none of the web; it says that sentences and beliefs have meaning or content independently of their relations to other sentences or beliefs. One major motivation for holism has come from reflections on the natures of confirmation and learning. As Quine (1953) observed, claims about the world are confirmed not individually, but only in conjunction with theories of which they are a part. And typically, one cannot come to understand scientific claims without understanding a significant chunk of the theory of which they are a part. For example, in learning the Newtonian concepts of 'force', 'mass', kinetic energy' and 'momentum', one doesn't learn any definitions of these terms in terms that are understood beforehand, for there are no such definitions. Rather, these theoretical terms were all learned together in conjunction with procedures for solving problems. The major problem with holism is that it threatens to make generalization in psychology virtually impossible. If the content of any state depends on all others, it would be extremely unlikely that any two believers would ever share a state with the same content. Moreover, holism would appear to conflict with our ordinary conception of reasoning. What sentences one accepts influence what one infers. If I accept a sentence and then later reject it, I thereby change the inferential role of that sentence. So the meaning of what I accept wouldn't be the same as what I later reject. But then it would be difficult to understand on this view how one could rationally --or even irrationally!-- change one's mind. Agreement and translation are also problematic for much the same reason. Holists have responded (1) by proposing that we should think not in terms of "same/different" meaning but in terms of a gradient of similarity of meaning, (2) by proposing "two factor" theories or (3) by simply accepting the consequence that there is no real difference between changing meanings and changing beliefs. Any particular type of holistic state will exist only rarely and transiently. In this respect, holistic mental states are like the states of computers. A total computer configuration as specified by the contents of every register in the internal memory and every cell on the hard disk will occur only rarely and transiently. There are deterministic laws of the evolution of total computer states, but they deal with such transient states. So psychological explanation will have to be seen by holists as like explanation of what computers do, in part a matter of fine grained laws of the evolution of systems, in part coarse-grained accounts of how the systems work that do not have the status of laws. It has sometimes been suggested that quantum phenomena exhibit a characteristic holism or nonseparability, and that this distinguishes quantum from classical physics. One puzzling quantum phenomenon arises when one performs measurements of spin or polarization on certain separated quantum systems. The results of these measurements exhibit patterns of statistical correlation that resist traditional causal explanation. Some have held that it is possible to understand these patterns as instances or consequences of quantum holism or nonseparability. Just what holism and nonseparability are supposed to be has not always been made clear, though, and each of these notions has been understood in different ways. Moreover, while some have taken holism and nonseparability to come to the same thing, others have thought it important to distinguish the two. Any evaluation of the significance of quantum holism and/or nonseparability must rest on a careful analysis of these notions. Holism has often been taken as the thesis that the whole is more than the sum of its parts. Several different interpretations of this epigram prove relevant to physics, as we shall see. Here is a correspondingly vague initial statement of nonseparability: The state of the whole is not constituted by states of its parts. It is already apparent both that holism and nonseparability are related notions and that their exact relation needs to be clarified. In one interpretation, holism is a methodological thesis, to the effect that the best way to study the behavior of a complex system is to treat it as a whole, and not merely to analyze the structure and behavior of its component parts. Alternatively, holism may be taken as a metaphysical thesis: There are some wholes whose natures are simply not determined by the nature of their parts. Methodological holism stands opposed to methodological reductionism, in physics as well as in other sciences. But it is a certain variety of metaphysical holism that is more closely related to nonseparability. What is at issue here is the extent to which the properties of the whole are determined by the properties of its parts: property holism denies such determination, and thereby comes very close to a thesis of nonseparability. By and large, a system in classical physics can be analyzed into parts, whose states and properties determine those of the whole they compose. But the state of a system in quantum mechanics resists such analysis. The quantum state of a system gives a specification of it’s probabilistic dispositions to display various properties on measurement. Quantum theory’s most complete such specification is given by what is called a pure state. Even when a compound system has a pure state, some of its subsystems may not have their own pure states. Emphasizing this characteristic of quantum mechanics, Schrödinger described such component subsystems as "entangled". Superficially, such entanglement of systems already demonstrates nonseparability. At a deeper level, it has been maintained that the puzzling statistics that arise from measurements on entangled quantum systems either demonstrate, or are explicable in terms of, holism or nonseparability rather than any problematic action at a distance. As applied to physics, ontological holism is the thesis that there are physical objects that are not wholly composed of basic physical parts. Views of Bohr, Bohm and others may be interpreted as endorsing some version of this thesis. In no case is it claimed that any physical object has nonphysical parts. The idea is rather that some physical entities that we take to be wholly composed of a particular set of basic physical parts are in fact not so composed. It was Bohr’s (1934) view that one can meaningfully ascribe properties such as position or momentum to a quantum system only in the context of some well-defined experimental arrangement suitable for measuring the corresponding property. He used the expression ‘quantum phenomenon’ to describe what happens in such an arrangement. In his view, then, although a quantum phenomenon is purely physical, it is not composed of distinct happenings involving independently characterizable physical objects--the quantum system on the one hand, and the classical apparatus on the other. And even if the quantum system may be taken to exist outside the context of a quantum phenomenon, little or nothing can then be meaningfully said about its properties. It would therefore be a mistake to consider a quantum object to be an independently existing component part of the apparatus-object whole. Bohm’s (1980, 1993) reflections on quantum mechanics lead him to adopt a more general holism. He believed that not just quantum object and apparatus, but any collection of quantum objects by themselves, constitute an indivisible whole. This may be made precise in the context of Bohm’s (1952) interpretation of quantum mechanics by noting that a complete specification of the state of the "undivided universe" requires not only a listing of all its constituent particles and their positions, but also of a field associated with the wave-function that guides their trajectories. If one assumes that the basic physical parts of the universe are just the particles it contains, then this establishes ontological holism in the context of Bohm’s interpretation. Holism is ecological in essence: Holism is an attempt at synthesis, rather than system of pphilosophy, per se. It doesn't challenge religion, but provides a worldview for preserving this unique creation. Nature displays obvious interdependence expressed as reciprocity between long-associated organisms, both plant and animal. (Smuts, 1952). Holism in Co-evolution means "Life forms are selected for, that have a common behavioural and physical characteristic; that is they conform to a COMMON PRINCIPLE defined by our material universe." This is the principle of compatibility, which leads one to a holistic conception, and is reflected in a behavioral strategy of the animal that ensures its perpetuation (survival). Smuts recognized in the discoveries of the New Physics of 1926, an important HOLISTIC principle: "the structural character of matter indicates that it is also creative, not of its own stuff, but of the forms, (chemical) arrangements, and patterns which constitute all its value in the physical sphere Holism is sourced in the very nature of the elements. Smuts recognizes what all religions call for: "how important a part moral discipline plays in the furtherance of the evolutionary holistic scheme." Holism influences our moral and ethical culture." Much of what Darwin said has the holistic signature. There are repeated examples of this. To use his own words, he uses the term "struggle for existence" in a "metaphorical sense" "INCLUDING DEPENDENCE OF ONE BEING ON ANOTHER (equated partially with compatibility), and including not only the life of the individual, but success in leaving progeny" (equated with PERPETUITY). "Therefore, as more individuals are produced than can possibly survive, there must always be a struggle for existence (interaction). Interactors he called "enemies or COMPETITORS." "Instead of the animistic, or the mechanistic, or the mathematical universe, we see the genetic, organic, holistic universe, in which the decline of the earlier physical patterns provides the opportunity for the emergence of the more advanced vital and rational patterns" (Smuts, 1952) Smuts sees the individual personality as central to Holism and as the most recent holistic expression that has emerged through evolution. He says, "To me the holistic aspect of the universe is fundamental, and appears to be the key position both for the science and the philosophy of the future. Charles Darwin observed that if any one species does not become modified and improved in a corresponding degree (coevolution) with its competitors, it will soon be exterminated." In Holism, this last principle differs from competition in that while becoming "modified and improved," interactions are altered to reduce the effect of interactors upon one another." Darwin introduces three principles fundamental to Holism:  the idea of co-adaptations and "complex co-adaptations of structure between one organic being and another, which we see everywhere throughout nature" (coevolution) and  the idea that interactions are economic: "natural selection is continually trying to ECONOMIZE in every part of the organization." The importance of interactions leads to the recognition that "each new variety or species, during the progress of its formation, will generally press hardest on its nearest kindred, and tend to exterminate them." A consequence of this interaction is the evolution of decreased interactions. "The truth of the principle, that the greatest amount of life can be supported by great diversification of structure, is seen under many circumstances." . . . "Natural selection will not produce absolute perfection," but does lead to improved varieties surviving." "Holism simplifies life and causes a peaceful order. Natural selection in the holistic model acts upon the individual" . . . " Adaptation, when between organisms that are both evolving, leads to what appears like group selection, but is coadaptation (in its many guises). Smuts' Holism presents another revolution that shall dawn upon us. As the facts of the world-view of Holism unfold we should see immense changes in our dealings with and understanding of nature. Holism will encompass every aspect of modern technology and require that we reform our association with nature and make our activities more benign." "Holism opens the door to religion. In holism there is the possibility for the unification of the religious, evolutionary, scientific and materialistic approaches to life. Holism requires a revolutionary change in attitudes from all sides to fit each as part of a whole system. With personality as the ultimate holistic expression, as believed by Smuts, its influence must penetrate our souls and extend out to the smallest life form! Something holistic is at the heart of things and in the nature of this universe, which is not a mere chance or random assemblage of items. The detailed things derive most of their meaning, significance and functioning from the whole of which they are but parts. They are not mere parts but really members of wholes. Both as a metaphysical and as a scientific concept the whole is basic to an understanding of the world. And in sociology and religion this is more clearly the case. Relativity is only a halfway house to this more fundamental concept" (Smuts, 1952)." A similar sentiment was expressed by Aldos Leopold, the American Environmentalist, ". . . the problem we face is the extension of the social conscience from people to land. No important change in ethics was ever accomplished without an internal change in our intellectual emphasis, loyalties, affections, and convictions." It is Hestia who helps us focus, concentrate, and balance our thoughts. Just recall how soothing it can be to sit in front of a fireplace in a calm, reflective mood. Like the other Virgins, Artemis and Athena, Hestia has her own style of illumination. Many times, without her, it would be impossible to perceive any images in the depths of our psyche. Therefore, she is a key to insight -- to grasping the whole picture. Focus, as a nexus point, creates heat and light in optics, as when we focus the sun's rays with a magnifying glass to start a fire. Not all of these images of burning and concentration are positive. Hestia has her own forms of pathology, such as "cabin fever," produced by long hours of isolation. Staying in one spot too long, we get "stir-crazy," agoraphobic, or depressed. Remember, Saturn is the father of Hestia. Depression which leads to brooding can lead to a meditative place, if the depression is deepened rather than avoided, or manically denied by "staying busy." Sometimes thoughts can burn with obsessive intensity. In some varieties of obsessive/compulsive disorder, there is a cleaning mania. Yet, in order to express wholeness, our Holy Grail must contain pathological aspects, the light and the dark fuel which feeds the fire. The idea of a sanitarium or healing center as a sanctuary fosters our ability to re-center ourselves away from the hubbub of urban life. A "center of activity" might be seen in the eye of a storm, a volcanic eruption, or a hot bed of political intrigue. All centers are not tranquil. That which lies in Hestia's center burns and smoulders. When we feel "burned-out" we need to readjust our focus, and frequently a change of location, retreat, or visit to a favored power spot in nature helps rejuvenate us. Sometimes we feel a need to remove ourselves from the whirl of activity at the center. When home life gets hectic with many visitors and chores pile up, we long for a vacation. Or, if home is quiet, it can be our refuge, our soft cocoon to cushion us from the pressures of outer life. On the psychological level, since Hestia is among the first-born of gods, she is a synthesis of their potencies, more fundamental than their later differentiation. She represents the fiery power of the true Self. Her center is "on fire" with life energy, which can manifest as volition, conscious and deliberate use of the will. True will comes from bringing the divine influences into an effective synthesis so that they come to a focal point within ourselves. A receptive will means "willingness" to experience cosmic influences through the practice of reflective concentration of the mind. If we relax our bodies, and center our energies with one-pointed attention, we gain access to the fiery life-giving energy of the Cosmos. This requires a quiet mind--an emptying of the mind--and reflects in a personality which doesn't spend a lot of time in idle chatter. It indicates a psychological interiority or inwardness and inner creativity. Hestia renounces outer life in the greater world-at-large for a more fulfilling experience of her inner Self. On the mundane level, the woman possessed by Hestia thinks that a woman's place is in the home (yes, they still exist). She inherently senses the divinity at the core of the situation, but renounces or sacrifices the possibility of experiencing herself through other gods in the field of archetypal manifestation. This natural attitude is often contaminated by cultural chauvinism. A modern phenomenon, the househusband is coming to know Hestia in himself through the endless repetition of archetypal household chores. But they can be healing like the Zen prescription to "Chop wood; carry water." Many men find great peace in this lifestyle, which they never found in the work-a-day world. This knowledge of Hestia as the ground of being creates a sense of inner space in the psychic domain. It is a very private form of awareness--the simple life. When attention is directed inward, there is little desire to be praised and lauded by society at large for our accomplishments. The solitude of household tasks is a special reward which goes beyond the pleasure of craftwork, sewing, cooking, etc. What one loses in public recognition is recaptured in the extra time available for introspection. One develops a sense of self-sufficiency. With Hestia animating the background of household duties, there is a sense of dignity restored to this function which is too often seen as distasteful or menial. The daily "rounds" are part of this central life mystery. It is a primal part of us, fundamental to our well-being. It may hark back to our days as cave-dwellers when perhaps the single most important function was that of keeping the fire going for the family unit--it meant warmth and nourishment at the most basic level. Hestia and Hermes represent the Greek imagination of motion and place. On the foot of the big statue of Zeus in Olympia, Phydias represented the twelve Olympian gods. Between Helios, the sun and Selene, the moon, he arranged them in six couples: Zeus-Hera, Poseidon-Amphitrita, Hephaistos-Charis, Apollo-Artemis, Aphrodite-Eros and Hermes-Hestia Hestia and Hermes are not husband and woman, nor brother and sister, nor mother and son either. They are neighbors, or better: friends. Where Hermes loiters is Hestia never far. Where Hestia stays, Hermes can appear at any moment. In its polarity, the couple Hestia-Hermes expresses the tension which is proper to the archaic representation of space. Space needs a center, a fix point from which directions and orientations can be defined. But space is also the locus of motion, and that implies the possibility of transitions, of passage from any point to any other. Hestia and Hermes belong to very archaic, pre-hellenistic representations. Hestia is the hearth. In modern Greek, istia still means the hearth or the household. The name Hermes comes from herma(x), hermaion or hermaios lophos, heap of stone. Before he became an Olympian god, Hermes was the personification of lithoboly, the gesture of throwing stones on tombs. He was the heap of stone or the wooden pole on a grave, but also the phallos. Hermes unites death and fertility in one figure. Hestia and Hermes, personifications of the hearth and of the protecting grave are the gods of the domestic domain. They are also the symbols of the gestures of women and men and of their interplay. Through that interplay, the house becomes a unique place in the world, a topos in a cosmos. Hestia and Hermes allow us a glance into Greek domesticity. In their interplay, we can understand something of the Greek household and its works and of hospitality. You live both on the superficy of the soil, in the beautiful dwellings places of men and women, and you are filled with mutual philía", said a Homeric Hymn. Hestia and Hermes are the epichthonian gods, the gods of the dwelled soil. They are everywhere where people make fire, trace limits, build walls and a roof over their heads. Together, they are the gods of orientation and of the tracing of limits. "Hestia: a Background of Psychological Focusing" in FACING THE GODS, James Hillman, Ed. (Barbara Kirksey, contributor). "Hestia: Goddess of the Hearth: Notes on an oppressed Archetype," SPRING JOURNAL 1979, Stephanie A. Demetrakopoulos. In the Greek myth, Hestia is depicted as a female dependent of Zeus. Her place in the family is somewhat like that of a maiden aunt, and her specific job was to tend the divine household fire. Her job was extremely important in ancient times since rekindling a fire could be a difficult task. As a stay-at-home virgin, Hestia was perfect for the job, since an unmarried sister had few other commitments in the outside world. Hestia therefore stayed at the sacred hearth on Mt. Olympus, even though she donated her throne to Dionysus. She was much like the fabled Cinderella, in that she stayed calmly behind while the others went about their business. Cinderella got her prince; Hestia gets her Self, her wholeness. We might call Hestia's quiet reflectiveness "the yoga of contentment." When our desires are simple and we have the spiritual capacity to be thankful for what we do have, it makes it easier to truly "be in the now." Otherwise we yearn for bygone times, or some idealized future when supposedly everything will be "right" or "better" or "fixed". The now has to be at least OK for our consciousness to be there, and truly inhabit that place. Otherwise it flits off in imaginal flights of fancy to another time and place. Hestia might be conceived of an "existential" goddess--one who accepts the human condition, and supports the state of consciousness that is neither riddled with toxic shame nor grandiose fantasies. These notions promote subhuman and superhuman attitudes, but Hestia is that union of opposites. By being most fully human, she expresses an inherently divine quality within that form of being. She doesn't mood alter by pumping up her expectations or sink into an escapist depression. She sticks in the moment, which is a very spiritual position from which to operate--it is the place of balance and stability which has its own form of momentum in terms of driving consciousness. She accepts life on its own terms, and finds contentment, fulfillment, and wholeness within what is given in the moment. She is at home in the Void. 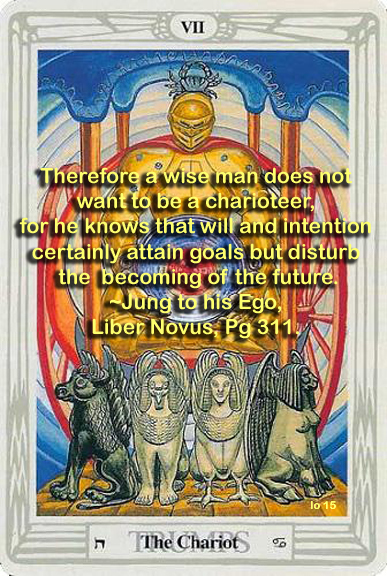 The conjunction of the card the Chariot and Hestia's meditation corresponds here with Merkaba mysticism --- meditation on the Chariot or Throne-Chariot of God. The mystics achieved a vision of this geometrical figure through meditation practice. This geometry was a 4-dimensional array of the holy letters on an octahedron within a cube; its geometrical reciprocal or dual is called Vector Equilibrium by Buckminster Fuller. The Throne-Chariot is a geometrical picture of the creation or formation of the universe--an omniradiant event that continues to happen. Those who engaged in this meditation form were known as Merkaba visionaries. They sought ecstatic direct visionary experience of the Throne Chariot of God, yet stopped short of any kind of mystical union with the radiant form they encountered. The Merkaba (pronounced with equal stress on each syllable. MER-KA-BA) is the activation of the "lightbody" vehicle. Everybody has various energy fields around their body. Merkaba activation techniques use intention to create a vehicle based on a sacred geometry design for a variety of purposes. The main purpose is to bring you to higher states of consciousness and awareness to fully embody the energy of unconditional love. Unconditional love is not an emotion, but a state of being. In Hebrew mysticism, the merkabah, or merkava, was the chariot/throne of light that Elijah ascended into heaven. It was described as a "whirlwind of fire." Interestingly enough, the Hebrew word for "whirlwind is purposely "misspelled" in this story, and preserved in many copies, when compared to other Hebrew references to whirlwinds. What was so special about this whirlwind? The Hebrew letters that spell the word Merkaba are Mem-Resh-Caph-Beth, from the root word Resh-Caph-Beth, meaning "to ride." The root word is the same as the root word for "cherub" a form of angel, for angels were believed to have these chariots of light to travel dimensions. The Talmud (Hebrew holy text) mentions the Merkaba in reference to Prince Judah who forbade mention of it in the text of the Mishnah. Many of these mystical teachings were shrouded in secrecy at the time, and many were told casual practice of such techniques would lead to madness or death. Later, the Kaballah itself was restricted to only married men over the age of forty. Merkaba mysticism was thought to be a form of astral travel, or total body travel. Elijah was said to "ascend" to heaven, body and all, and never die. The exact techniques the ancient mystics used are unknown, though many assume it to combine prayer, meditation and some form of yogic posturing. Currently, many believe to have recovered the techniques through channeled sources, such as the Keys of Enoch by J.J. Hurtak. 1. The aspirant must be at least 30 years old before his study of mysticism should be initiated. This ensures grounding in the day-to-day life and reduces the chances that the immature seeker desires transcendent escape from reality. 2. Specific moral qualities were required of candidates before the mystics were willing to reveal their secret knowledge, or Gnosis. We might assume that these qualities would include those of importance in the Torah, or Law. 3. Twelve to forty days of ascetic practices, including fasting and prayer, preceded the soul's penetration to the revelation of the Throne. 4. Techniques for facilitating the journey included hymns and songs, the recitation of secret or holy names of God, and magical seals to protect the aspirant. These seals warded off danger from demons and hostile angels and allowed further access, much as a key unlocks a door. 5. The posture recommended during meditation is to sit in a low chair, bend forward until the head rests on the knees. This posture enhanced the ability to experience altered states of consciousness through changes in blood flow and subtle vibrations induced in the skeletal system by reciting god names. Breathing becomes shallow in this position. 6. The further one progresses upon the path, the greater the dangers of psychological disintegration. The worthiness of the soul is tested on every level--physical, emotional, intellectual, and spiritual. The Qabalistic practice of creating and dissolving images as containers for psychic forces acts as a protection against identification with, or deification of symbols. Such potent symbols of wholeness, such as the Tree of Life, are a danger in themselves as they promote the identification of the ego with the Self. If the aspirant were unworthy, he could penetrate no further. The angels guarding the gates would confuse his mind and disturb his senses, (which shouldn't be too difficult after 40 days of fasting). This interference could include hallucinations (rather than visionary experience), and psychosomatic manifestations of discomfort. In the Eastern systems of meditation, these phenomena are regarded as blocks to the flow of Kundalini up the spine. 7. Once the ecstatic state has been attained by the mystic, he ascends through what were variously described as seven heavens or chambers. The soul ascends toward its original home. Counting from the bottom of the Tree of Life upwards, this would include the spheres of Malkuth through Chesed. 8. At this point the soul receives its revelation. It is the vision of God as King on His Throne. This vision of God as King is the magical image of the sphere Chesed, #4 on the Tree of Life. It is below the Abyss, where visionary I-Thou imagination is still possible. The gulf between the soul and God is not bridged below the Abyss. This meditation did not aspire to even an understanding of the true nature of God, let alone a reunion of the soul with Godhead. It was ecstatic, not transcendent. This mystic path provided perception of the phenomena of the Throne-Chariot, the awful mystery that surrounds God's majesty. A voice is heard to speak from the "Throne of Fire." It conveys the secret of heaven and earth to the aspirant. It gives him the names of Knowledge, or Gnosis. Use of this Knowledge could be viewed as the aspirant's creation of the sphere Daath. Daath is unique among the Sephiroth on the ascent up the Tree. In order for the initiate to experience Daath, he is required to first create it. This is unlike the other spheres, which are a priori givens. Experience of the reciprocal view of the Diamond Body figure brings one back onto the Middle Pillar on the threshold of the Abyss. In The Diamond Body, we find that, Meditation is a procedure. Daath, as a knowledge-contact, is a quantum change induced through Grace. It is God's answer to the call of the aspirant, and cannot be induced through effort alone. In creating a Daath state of consciousness, the aspirant has crossed 'an abyss' from a procedure to a grace. In a classification of creative, psychedelic (mind-expanding), and unitive states, this development is best described as 'psychedelic.' The characteristic experience is a transient altered state of consciousness. This ecstasy includes the experience of loss of self, time, or space. There is an infusion of a special knowledge, and a purification of self. The original Merkabah mystics did not aspire for this vision with intense love of God. They did not concern themselves with speculation concerning the immanence of God in matter, through the Shekinah. Their interest lay in the direct experiential process of contemplating their mandala-symbol until it took on a life of its own--a divine life. This entity projectes a revelatory character. But the immanence of God-in-matter is a philosophical issue open to speculation. The geometry of the Throne-Chariot or Diamond Body relates directly to the formation of matter. We might speculate that these geometrical representations of archetypal relationships have a great deal to do with fundamental patterns underlying all matter, even if they are only Ruachian models. The figure of the Throne-Chariot (and its reciprocal, the Vector Equilibrium Matrix) and the basic blueprint for the formation of matter are not distinct and separate. This threshold of matter, or DAATH, the Invisible Sphere does disclose the minimum conceptual elements necessary to depict the spiritual order inherent in matter. There is no way to intellectually grasp Reality beyond the Abyss. Penetration into these realms requires intense devotion or love. For any information regarding these planes we must rely on the testimony of saints who have journeys in consciousness to these realms. Knowledge (Gnosis or Daath) takes the soul to the uppermost reaches of the causal plane. This is the limit to the realm of the mind. There is neither mind nor matter across the Abyss. Here is the limit of the mind's ability to comprehend divine order conceptually. It is the emptying out of symbolic meaning in preparation for direct experience of the Reality of God, through Union. Several graphic depictions of the descriptions of the Throne-Chariot given in the SEPHIR YETZIRAH have been developed through the years by Jews and occultists. A group known as the Chariot of Fire from Los Angeles has used the information to depict a system in which all the paths are compacted onto an octahedron. In this arrangement, the seven double letters are paths connecting the six spheres which correspond to the cardinal directions, above and below, and the central Inner Court. This Inner Court is comprised of the three Mother letters--Aleph, Mem, and Shin--plus the nexus point which is composed of Aleph/Tau. In his book, THE TAROT (1947), Paul Foster Case developed an array which shows closer harmony with the closest-packed spheres of the diamond structure. Here the paths are dispersed over the octahedron and its containing cube. It is important to include both the octahedron and the cube in the modeling. When both are visualized, the figure has the ability to reproduce itself indefinitely. It generates and regenerates itself mathematically, like a fractal. It projects outward or inward in an infinite geometrical progression. There is an infinite series of octahedrons within cubes within octahedrons within cubes. This is another way of viewing the matrix structure which has been described elsewhere as the Vector Equilibrium Matrix, and it shares its essence with the qabalistic Tree of Life geometry. In hermetic magic, a lightbody vehicle, or body of light, is activated to do more advanced magical work. The Mer-Ka-Ba is the vehicle of Light mentioned in the Bible by Ezekiel. Some say in Egyptian, "Mer" means Light. "Ka" means Spirit. "Ba" means Body or Reality. The word Merkabah is Hebrew, meaning "chariot" or "vehicle", from the Hebrew root resh-kaf-bet meaning "to ride". Merkabah mysticism ("ma`aseh ha-merkabah") is a branch of Jewish Kabbalah. It refers to Ezekiel's vision. (see Gershom Scholem "Kabbalah" page 373). From Aryeh Kaplan "Meditation and Kabbalah" page 19, we hear: "The word Merkava comes from the root Rakhav meaning "to ride", and hence means a "chariot" or "riding vehicle". In general, the concept of riding involves travelling and leaving one's natural place. When the Bible says that God "rides", it means that He leaves His natural state where He is absolutely unknowable and inconceivable, and allows Himself to be visualised by the prophets. One who "sees" God in this manner is said to experience a Merkava vision. The term Maaseh Merkava or "workings of the Merkava" refers to the setting up of a Merkava, that is, attaining a state where a Merkava vision can be attained. From the context in which this term is used in the Kabbalah texts, it is obvious that Maaseh Merkava refers to the meditative techniques involved in attaining this mystical experience." Most modern students of Qabala are familiar with the standard 2-dimensional representation of the Tree, which is drawn "flat," even though the circles are always conceived of as spheres. There is also a long tradition of a so-called 4-dimensional Tree of Life diagram, based on The Book of Formation -- Sephir Yetzirah. This geometrical figure consists of two interfacing pyramids surrounding a central core, within an enclosing cube. This octahedron-within-a-cube happens to be the crystal structure of diamond, a face-centered-cubic lattice. Recalling that Abraham is also the patriarch of the Moslems, it is interesting to note reference to a spiritual body, a "diamond body", in the writing of Shaikh Amad Ahsa'i from the 13th century. Speaking of a substance akin to that of the medieval Philosopher's Stone, he equated the "diamond body" with the "Resurrection Body" of the faithful believer in the Paradise of the future Aeon. For the Qabalists, meditation on this figure provided a mystical body as a vehicle for consciousness in imaginal space. This diamond body was used during meditation to enter the inner court of Divinity, symbolized by the center of the figure. Here the Beginning and End of time are co-temporaneous, space ceases to be a hindrance, and the mystic beheld the ecstatic vision of the Lord on His Throne. The geometry was a "gateway" to another dimension of experience. This Alpha-Omega point has all the physical qualities of Vector Equilibrium. The ancient meditation practice was known as Merkabah mysticism, and those who practiced it called themselves, "Riders in the Chariot." They claimed to see into the future. This insinuates that the figure is a "vehicle" for moving consciousness through imaginal time and space. It seems to be a metaphysical "time machine," or inter-dimensional gateway. As in most design or mandala meditations, the aspirant pictures him or herself at the center of the figure through visualization, contemplation, and identification. Through this process of centering, these mystics came to know themselves and God. Perhaps they learned, as Fuller later discovered, of the unusual anomalous conditions of perfect equilibrium. This meditation provided a specific technique for escaping from time. Its realization meant instantaneous enlightenment, a paradoxical leap out of Time. It yields transcendence. Occultist, Paul Foster Case published an array of this type in his book, The Tarot (1947). Aware of the ancient mystic practice, he included the figure in his study of Qabala, calling it alternately the Key of the Cosmos and Numbers, or the Cube of Space. Again, we have the form of the octahedron-within- a-cube. Vector Equilibrium and the Cube of Space are mathematical duals, or reciprocals of one another. They "jitterbug" back and forth as the figure grows outward to fill all space. They are two ways of looking at the same geometrical phenomena. Case pointed out that its construction was based on the six-pointed Star of David, (or Shield of David), also known as "The Star of the Macrocosm." His descriptors of zero as a sacred, empty, consciousness field reiterate the qualities of Vector Equilibrium. Zero is a symbol of the absence of quality, quantity, or mass. Thus it denotes absolute freedom from every limitation whatever. It is a sign of the infinite and eternal Conscious Energy, itself No-Thing, though manifest in everything. It is That which was, is, and shall be forever; but it is nothing we can name. Boundless infinitely potential, living light, it is the rootless root of all things, of all activities, of all modes of consciousness. In it are included all imaginable and unimaginable possibilities, but it transcends them all. The Qabalists call it: (a) No-Thing; (b) The Boundless; (c) Limitless Light. Pure Conscious Energy, above and beyond thought, to us it is Superconsciousness. With their fascination for completely regular figures, the Greeks devised a way of establishing XYZ coordinates within a cube. Our science and method of orientation has been stuck with that model ever since. However, nature's own most economical coordination is in triangles and tetrahedra, rather than squares or cubes. Vector Equilibrium is more in line with modern Quantum Mechanical models than the Newtonian XYZ. It expresses more degrees of freedom. So, close examination of the underlying geometry of the Tree of Life reveals that the ancients were not lacking a very deep intuitive awareness of the true structure of matter and the universe. The underlying geometrical matrix of the multi-dimensional Tree is, in fact, Vector Equilibrium. All virgin Goddesses including the Christian Virgin Mary; Semetic Lilith; Roman Diana; Durga; Greek Athena Hestia/Vesta and Artemis; Gnostic Sophia; Celtic Arianrod and Brigit Brigit, another virginal goddess, is considered Goddess of Fire, Patroness of smithcraft, poetry, and healing. She bestows her blessings on any woman about to be married or handfasted ("Bride" is derived from Brigit). On Brigit's Day, in honor of the Irish Goddess Brigit, 19 Priestesses (no men were allowed) kept a perpetual flame burning in her honor. Those who speak for Hestia today might include Betty Furness, consumer advocate; or Heloise, of household-hint fame. She is also exemplified by some attitudes of women in the "Moral Majority." She is alive in the thousands of voiceless volunteers who keep our homes and communities running smoothly. Most of her examples are neither well-known nor vocal, as this is not their temperament. They seek to serve in a quiet, selfless manner. An example of this archetype may have been the voice of the housewife poet, Silvia Plath. Modern devotees of spiritual disciplines offer themselves for seva or selfless service, thereby building and expressing compassion. Other serve humanity through community service. 1. How do you feel about the repetitious duties of household management? Do you give them the honor and value they deserve? 2. Can you derive a quiet, inner satisfaction from the little chores or service you offer to another. Do you crave their gratitude or offer it simply from love and warmth? 3. Do you have a special place, outside or inside in your imagination, where you can center and ground yourself? Describe this experience and how it feels. 4. Describe the fires smouldering in your deep center. What do they connect you to? 5. Have you ever experienced a depression which led to renewal of your spiritual volition? or drove you to seek solace within through meditation or experiential psychotherapy? 6. The original meaning of Virgin is whole-in-herself. Describe a period when you felt a connection with this virginal sense of wholeness during a period of quiet reflection. Did you pause to notice it as such at the time, or only upon reflection? 7. Imagine practicing "the yoga of contentment." How would you describe your present situation if you looked at it from the perspective of fulfillment as a "just so story." What complaints and disappointments would be eliminated from your internal self talk. What aspects of life would you now notice as simple blessings? 8. Do a quick reality check on your current situation in regard to your idealized hopes and dreams, and daydreams. What does living in the now mean for you in terms of contentment with your existential situation? 9. It has been said that we all serve somebody. Whom do you serve, and in what capacity? Who do you serve spiritually? 10. What does compassion mean to you? What experiences led to an increase in your sense of compassion? What humanitarian causes do you support and how? 11. What mask (persona) are you presenting to the world? What emotional reactions are you hiding with "detachment"? What contradictions and tensions are you struggling to maintain control over? Where have you experienced recent victory or success in your life? What progress are you making in testing your abilities in the outer world and in the inner world?